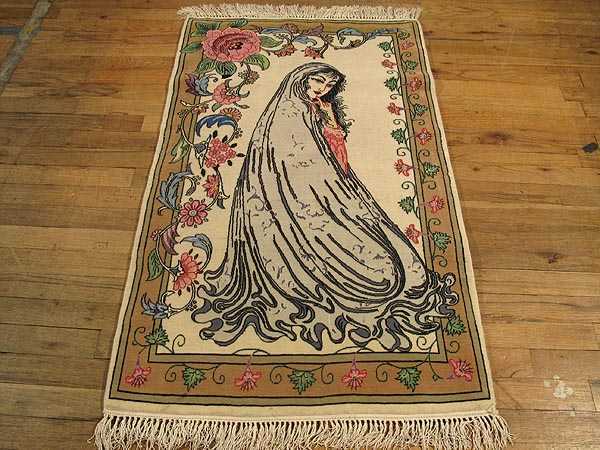 "The Isfahan rug is among the most elegant and consistently fine carpets produced in Iran. The prestigious Esfahan rug is constructed with a cotton or silk foundation and the finest Kurk wool pile. The Esfahan rug reached the height of its fame during the Safavid dynasty due to east-west trade routes that were part of the Silk Road. Patterns found on a classical Isfahan rug include spiraling vinescrolls, formal pictorials, grand medallions and lavish Shah Abbasi palmettes set over a creamy ivory, soft blue or subdued red field. Today, the city of Isfahan is a World Heritage site that produces many of the most sought-after Persian carpets. #9608"